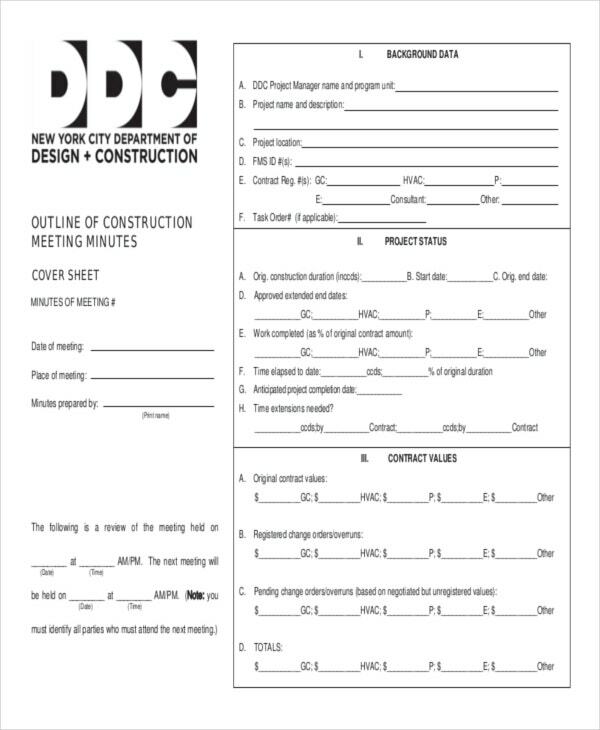 Our website has a wide and extensive range of construction minutes templates that can serve you a lot of purposes and help you out with tasks related to construction. These templates are available in different styles and patterns that give you a variety to choose from. These are present in proper and complete formats so that your work becomes easy and you save a lot of your time. You can also see Board Minutes Template. These templates come with high resolution and excellent print that are bound to leave a great impact. They can also be customized or edited according to your need. The texts can be edited too. You can download and print them from our website in PDF format. You can also see Minutes Template. Pre-construction minutes deal with the various requirements that are needed and are mandatory for the construction meetings to take place. 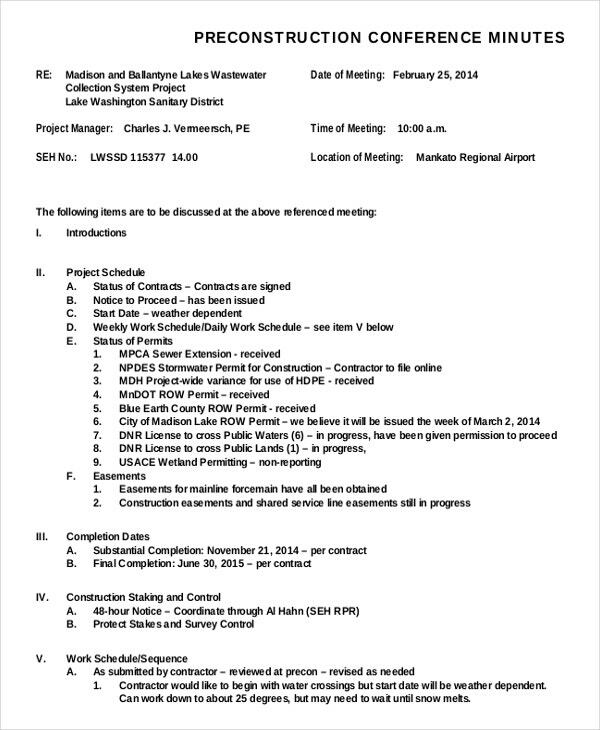 These pre meeting minutes consist of check lists, plans and strategies to be used before the project is started. When it comes to the format for these pre- construction minutes then they are already pre-defined and are designed according to professional formats. The project team meeting construction minutes are all about the everyday meeting, and regular decisions taken every day. 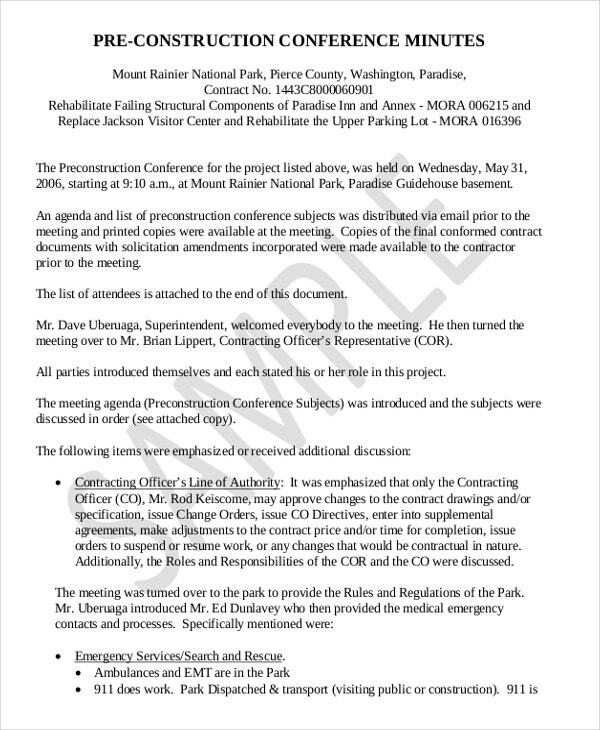 This types of construction minutes do not need to be pre-planned and can be held anywhere in the office. Since they are small meetings, the minute templates for this purpose do not need to be very strict. Informal construction minutes can easily be used for this. The project close out construction minutes are held at a particular venue so that a fixed decision is supposed to made. 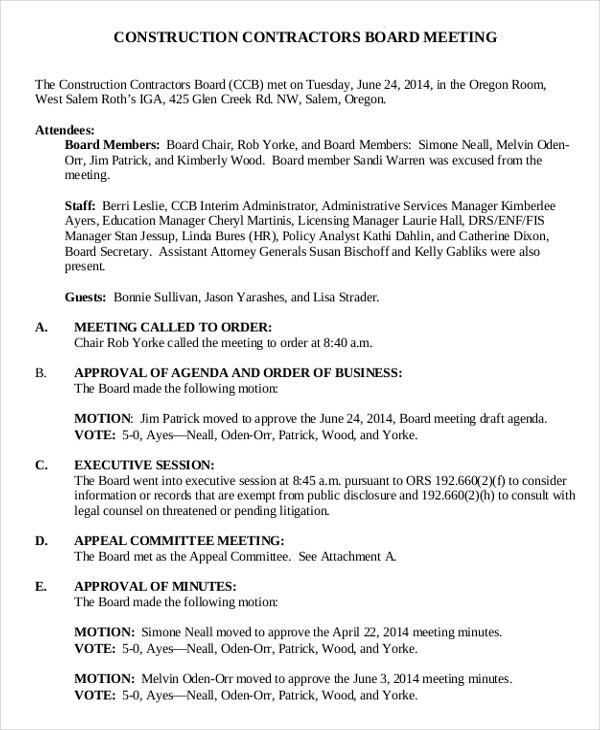 The results of the meeting are declared after reference to the construction minutes that were pre- made. The information in the minutes consists of the productions caste for the project, the establishment of the project and recorded discussions. 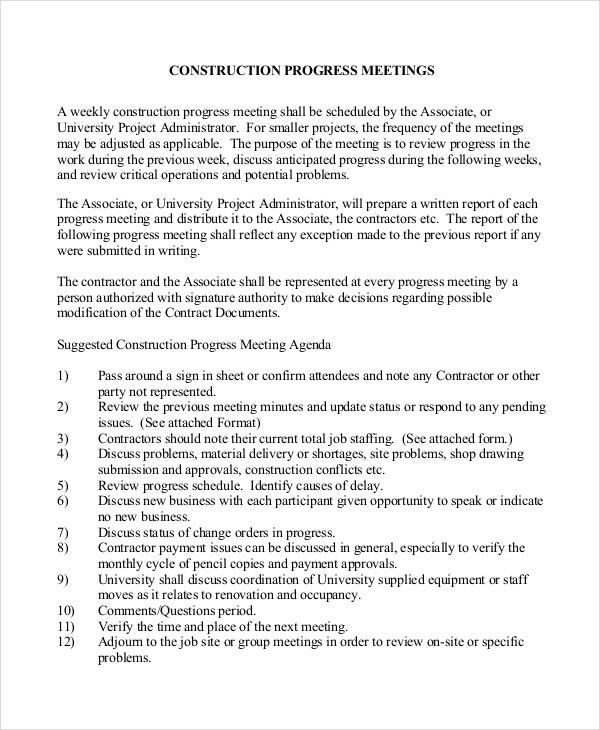 Any office staff or employee, or any member who is a part of the construction branch of the office can have access to the construction minutes templates. These organized templates deal with pre- meeting, post meeting and mid- meeting minutes. The mandatory information here is very useful for most of the office people since they act as source of information for all documents and many more. You can also see Business Minutes Template. > What Benefits will one achieve by using Construction Minutes Templates? There are several pros of using construction minute templates. When these minutes are note down then they are maintained as records for future references. The staffs will be regularly updated with alteration of rules and regulations with the help of these construction templates. 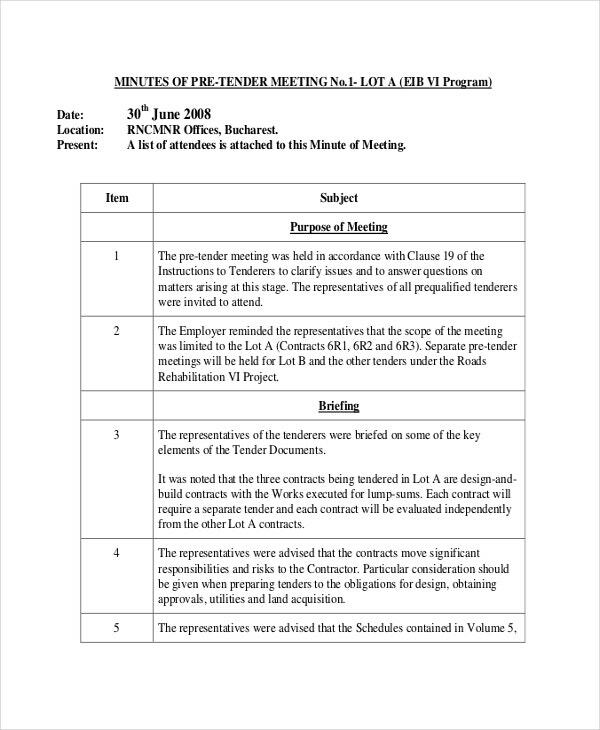 You can also see Committee Meeting Minutes Template. Further on, if a person is starting with a new project and needs to forward information of directors and officers then these minute templates are used for evidence to inform the higher authorities about the actions taken any further. 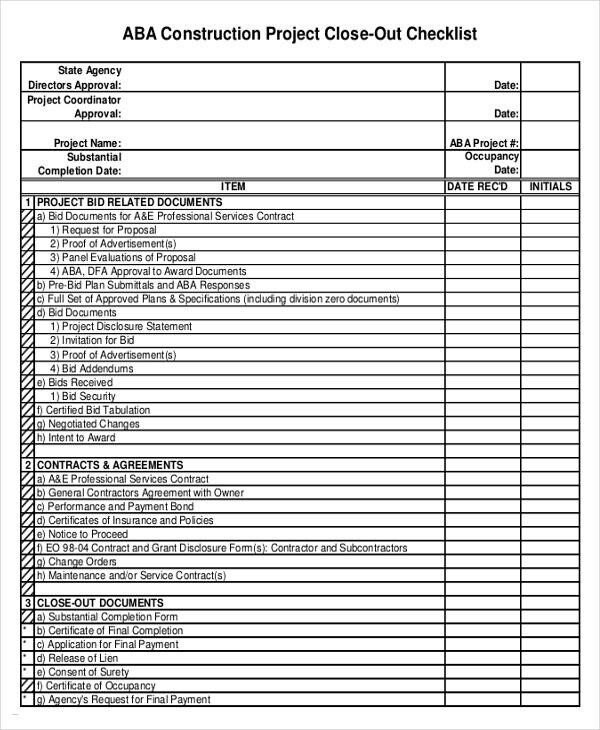 > How to Create your Own Construction Minutes? It is very easy to create your own construction minutes. Firstly you need to fill in the mandatory columns with required information. Then you further proceed with the points of pre meeting and post meeting minutes. Then you see the format is correctly based on professional grounds or not. Further you may then use the sample example pre-defined minutes to check in case of a mistake or error in the document you created. You can also see School Meeting Minutes Template. 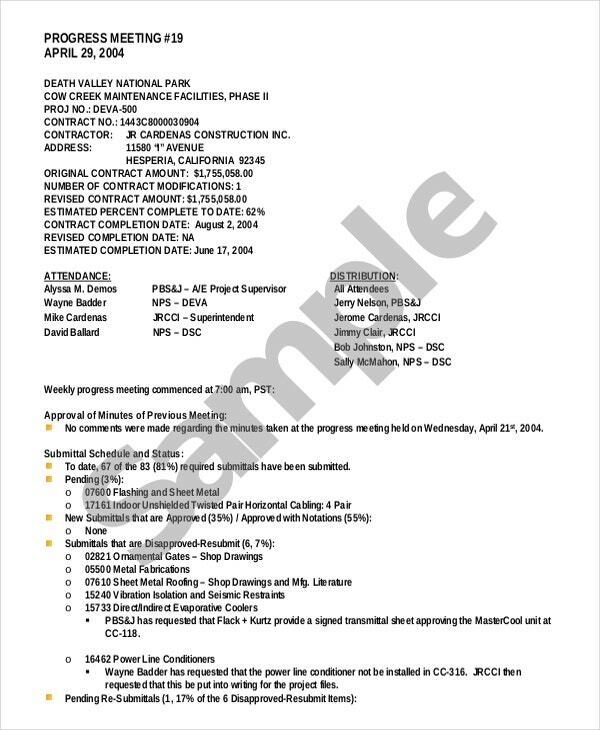 When it comes to construction minute templates then the best way to take care of all possible detail is to download the format of the construction minutes. 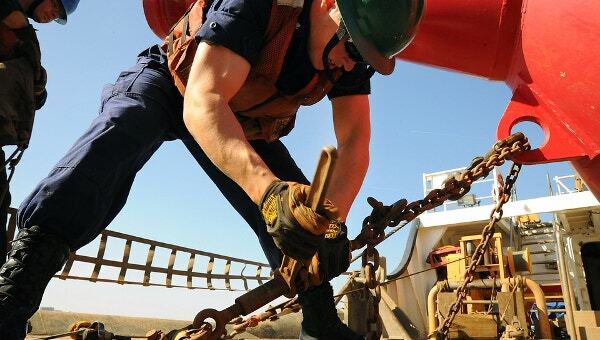 The format used for the construction minutes is a 100% success, and they are user friendly and very easy to use. When it comes to printing options, then they are available in various formats such as PDF, PSD, and word format. Any suggestion to change the format shall be acceptable and looked upon on future templates.